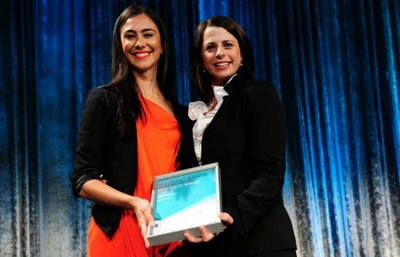 22 Michaels: Telstra Business Women's Awards - Jodie Fox! Last Friday saw the announcement of the New South Wales Telstra Business Women's Awards and out of thousands of entrants, our very own Jodie Fox was a finalist in 3 categories, and won the Hudson Private and Corporate Sector Award in amongst a seriously amazing and inspiring field of candidates. Catherine Burn of the NSW Police won the White Pages Community and Government and the overall award for NSW. As a winner in NSW, Jodie proceeds as a finalist in the national awards which are held in Melbourne on 18 November. The Telstra Business Women's Awards are a very well organised and impressive program and past winners include some of Australia's most talented business leaders. Hats off to Telstra and the other sponsors for putting together such a great program.